Department of Justice National Caseload Data shows that 96% of public corruption complaints are not prosecuted in Upstate New York, unlike downstate New York, where the … …prosecution rates were around 30%. Is it any wonder why there are so many lawsuits being filed at the expense of we the taxpayers. This was easily proven in the Stahlman case where “Officer” Ronda Bush stated that she wanted to pursued litigation in the matter all the way until it could not be pursued anymore. In was in that matter she was judged a perjurer by the county judge that got two innocent teenage boy thrown in jail. On cross the defense attorney questioned her on her pursuit which she admitted it did not cost her anything, it was we the taxpayers who were paying for it, This is the attitude that the corrupt DA’s office has towards we the people, we are paying for it with our tax dollars so who cares. Sure they pay to, but with salaries over $100,000 why should they care. They will just get raise at our expense to compensate for their criminal conduct. Look at who is driving around in late model automobiles. They are parasites. Is it any wonder why people are fleeing the state and in doing so creating a bigger tax burden on the ones remaining. This was very evident at the Stahlman trial, In Cattaraugus Count, New York. In which a native American family was targeted by the corrupt local district attorneys office. They actually flew in one witness all the way from Florida on our tax dollars the county taxpayers. It was evident right from the beginning it was a set up. Even the jury saw through it. This is how the corrupt power of the state works. They throw so much at you and they are using your tax dollars to do it. Hitler would have love modern Police State New York. This criminal conduct by public officers will lead to new lawsuits against the county at your expense. There is already one four million dollar lawsuit and we are aware of others that are in the works. In Cattaraugus County the District Attorneys subordinates perjury. They will file false documents and assist corrupt cops in making more false claims. They actually encourage it. In a recent study carried out by the TRIBLIVE using data provided by the Department of Justice it found that about 3% of complaints filed against corrupt law enforcement is prosecuted in upstate New York. The same six month study also found that about 30% of complaints are prosecuted in downstate New York. 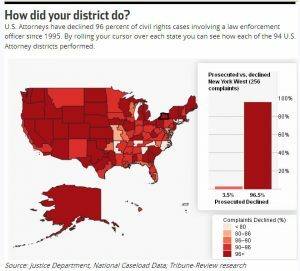 In general, for all other crimes allegedly committed in the US, prosecutors rejected only about 23 percent of complaints. The article by the triblive contains a interactive map so you can check out other ares of the county. The statistics are appalling. Is it any wonder why American has 5% of the worlds population yet 20% of the worlds prison population? Higher then that of Russia or China. It is the laughing stock of the world. Why do you think you see the rise of Donald Trump. People are sick and tied of the status quo and they want real change. We’re No. 1 – in corruption. No other state has more legislators forced out of office by ethical or criminal issues than New York. As recently as March, 2016, one man who was prosecuted for murder is claiming it was all a set up by the corrupt prosecutor in a rigged trial. Trial rigging is nothing new for Cattaraugus. It occurred to the man who is now suing the county for four million dollars. Polls conducted in New York also mirror this sentiment. New York led the nation with 2,522 public corruption convictions between 1976 and 2010, or an average of 70 a year, according to a 2012 report from the University of Illinois at Chicago. Americans have a FIFTY-EIGHT TIMES (58X) greater chance of being killed by a cop then they do by a terrorist . Harvard study suggests the number of homicides committed by police in the U.S. is higher than we thought . Irving Younger, a onetime New York City Criminal Court judge, described police testimony in search and seizure cases this way: “When one . . . looks at a series of cases, [ it ] then becomes apparent that policemen are committing perjury at least in some of them, and perhaps in nearly all of them.” . In one survey, defense attorneys, prosecutors, and judges estimated that police perjury at Fourth Amendment suppression hearings occurs in twenty to fifty percent of the cases . Jerome Skolnick, a veteran observer of the police, has stated that police perjury of this type is “systematic.”  Even prosecutors — or at least former prosecutors — use terms like “routine,”  “commonplace,”  and “prevalent”  to describe the phenomenon. However, lying about events in the interrogation room may be routine as well . Police perjury also occurs in connection with the fabrication of their reports,. In one study, in which prosecutors, judges and defense attorneys were the questioned. 52% of the prosecutor “knows or has reason to know” that police fabricate evidence, and 93%, including 89% of the prosecutors, stated that prosecutors had such knowledge of perjury “at least some of the time.”  Sixty-one percent, including 50% of the state’s attorneys know or have reason to know that police fabricate evidence, in case reports 50% of the prosecutors believed the same with respect to warrants . Professor from Georgetown Law addressed what he called the psychology of courtroom lies. Who lies and why. He found during his research that cops lie between 32% and 38% of the time in court, while the general public lies around 15% to 21% of the time. He felt there were many reasons for this, not just a single simple answer. Those reasons ranged from the knowledge that courts rarely if ever hold officers in contempt or punish them criminally for perjury. To some jurisdictions that punished cops for failing to recall details of a case during court.Also he interviewed a psychologist who raised the issue that certain occupations attracted certain types of personalities. Such as fighter pilots and astronauts attract certain types of personalities that hold mental focus well under stress and score much higher than the general public on timed tests that increase in difficulty. Law enforcement was one occupation that attracted personality types with borderline narcissistic personality disorders. People who existed in a boundary between healthy narcissism and narcissism as a full blown disorder. Most of them saw themselves as special, entitled, believing one should have whatever one wants, or achieving a stated goal regardless of the feelings of others or the means to achieve it. And inflating oneself while putting others down.One such quote fits this description very well.“It is said that power corrupts, but actually it’s more true that power attracts the corruptible. The sane are usually attracted by other things than power.” . Orfield, supra note 13, at 83 (“Respondents, including prosecutors, estimate that police commit perjury between 20% and 50% of the time they testify on Fourth Amendment issues.”). It should also be noted that many of these respondents did not consider lying at a suppression hearing perjury, infra text accompanying note 47, which would have the effect of deflating these percentages. Jerome H. Skolnick, Deception by Police, Crim. Just. Ethics, Summer/Fall 1982, at 40, 42. Scott Turow, Simpson Prosecutors Pay for their Blunders, N.Y. Times, Oct. 4, 1995, at A21 (Turow was a prosecutor for several years.). Younger, supra note 12, at 596 (Younger was a prosecutor and a judge.). H. Richard Uviller, Tempered Zeal: A Columbia Law Professor’s Year on the Streets with the New York City Police 116 (1988) (Uviller was a prosecutor for 14 years.). Uviller, supra note 20, at 116. Mollen Report, supra note 11, at 38. Stanley Z. Fisher, “Just the Facts, Ma’am”: Lying and the Omission of Exculpatory Evidence in Police Reports, 28 N. Eng. L. Rev. 1, 36-38 (1993). Myron Orfield’s study of the Chicago system, note 13. Orfield’s, supra note 13, at 109.